I love juicing. Pain in the A to clean the juicer but all for a good cause - health. There are two recipes I continuously go to and I'm going to share them with you today. Apple wise I tend to either use golden delicious or pink lady. Pink lady is what I opt for when I'm doing the pink lemonade. I'll juice what I'm going to have tomorrow, tonight so I'm ahead and prepared. I'll just store it in the fridge. You'll want to store it in a glass container as this will delay oxidisation. Leave as little air space as possible (I've been sipping mine in the images above) so that when you open it, it'll overspill slightly. Citrus fruit tends to stay fresher longer than fruits such as apples. If you want you can freeze them and take them out in the morning to defrost and have later on too. (Freeze it in a plastic bottle but hunt for the right bottle e.g. stainless steel water bottle). I do prefer to drink my juices as soon as they are made and tend to not leave them refrigerated for more than 8 hours if possible. Some nutrients are lost but you still have a fresh and beneficial juice when stored too - just not as much. Apple - Vitamins A, B1, B2, B6, C.
Banana - Vitamins B,C, Beta-Carotene, folic acid. Lemon - Vitamins C, Beta-Carotene. Pear - Vitamins B6, C.
Kale - Vitamins B, C, K, Beta-Carotene, Folic Acid. This looks amazing, thanks for sharing! Definitely have to get my juicing game on. Looks so pretty! Would love to drink these. 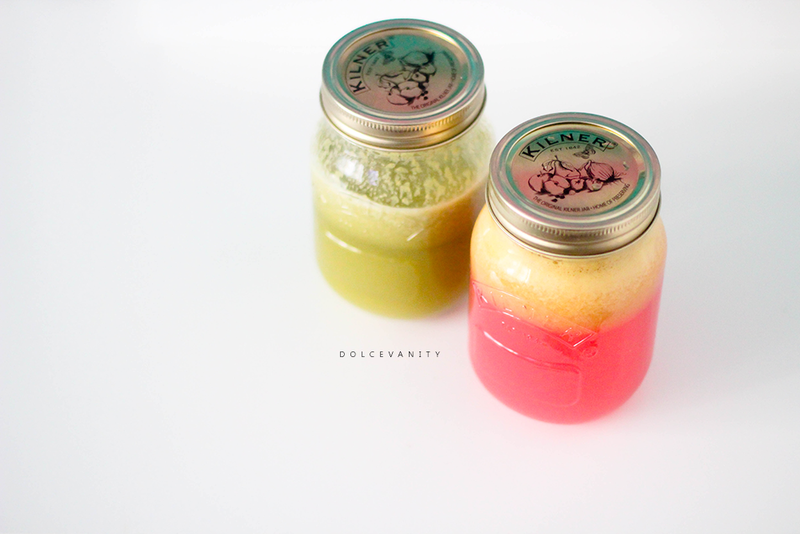 These look so good, I really want to get into juicing to lose some pounds! I've been begging my mom for a juicer or blender (or something!!! ), but to no avail... :'( The drinks look delicious.